Russell Manning has been selling property in Leeds for the last 25 years, so he knows what he's talking about. He now runs one of Leeds' largest estate agency chains, Manning Stainton, which has 11 offices around the city. According to Mr Manning, the market has risen by 30% over the past two years, and is set to continue growing. Get talking to someone in Leeds about house prices, and they will eagerly tell you in animated terms by how much their house has gone up in value over the past couple of years. It is no different from many other parts of the country, in this respect. But the boom is higher than the UK national average. According to Halifax's house price index, property prices rose by 12.1% last year in Yorkshire, while the UK national average was 11.7%. According to Halifax's latest survey of estate agents in Leeds, "market confidence remains high". Mr Manning reiterates these sentiments. "We are very fortunate that there is very strong employment in Leeds," he says. "The economy is robust and I think Leeds is very fortunate that it has never relied on one particular industry, such as Sheffield for steel and Newcastle with ship building." But he does not think that prices will spiral out of control, as the northern temperament will see to that. "I think there is a natural caution among northerners. If things have grown too rapidly there is a tendency to pull back. We never saw the negative equity to such an extent here as in the south," he says. 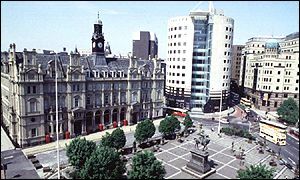 The cost of an average home in Leeds is now £84,550, second only to York within Yorkshire, and much higher than other cities in the area, such as Bradford and Hull. Two years ago, it was only £69,300. Rapid development has taken place in the north part of the city, the main commuter area surrounding Leeds and other suburban areas, such as Headingley - the university area - and Roundhay. But there has also been a knock on effect on towns like Pudsey in the west and Morley in the south west of the city. Much to the chagrin of young people living in the south and particularly London, purchasing a first-time home is still affordable in Leeds. You can pick up a three bedroom semi for less than £60,000, the price of a garage in London. With a bigger budget, you could pick up an "executive" home, in Leeds' "Golden Triangle". This exclusive commuter area is close to Harrogate, Leeds and only a quick canter to the Dales for weekends. A new 7,000 square foot home recently sold for £1.4m at Alwoodley, on the cusp of urban sprawl and next to the road to Harrogate. While the Golden Triangle's boom continues, huge swathes of Leeds are far from prosperous. Leeds has some of the most deprived wards in the country, with nine classed as "disadvantaged" by the Inland Revenue under its recent stamp duty review. Since 30 November 2001, people buying in one of these nine wards, which include areas such as Harehills and Chapeltown, will not have to pay stamp duty on properties up to £150,000 in value. Mr Manning says that he doesn't believe it is influencing buying patterns. "Stamp duty abolition has had no effect at all," he says. "I don't think it is will work. It is very difficult to interfere with market forces. I think it was a bad proposition."